The craftsmanship of his facial features is exquisite and so elegantly portrays the experience of bliss. Gaze at this crop! Inside, the pillars were covered with finely carved images of meditating figures. Note how the natural striations in the rock add to the beauty of the artistry. 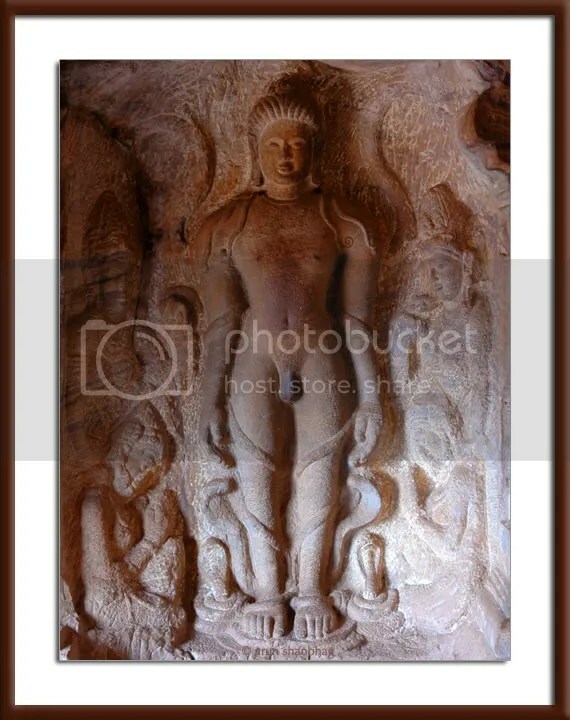 Another sculpture of Mahavir inside the cave. 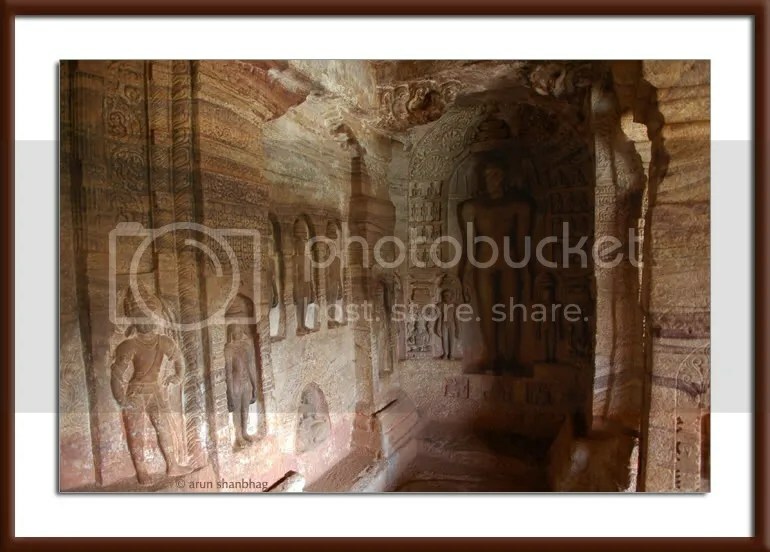 Here, the striation on the walls covered with meditating figures draws our eyes to the Tirthankara protected in his alcove. 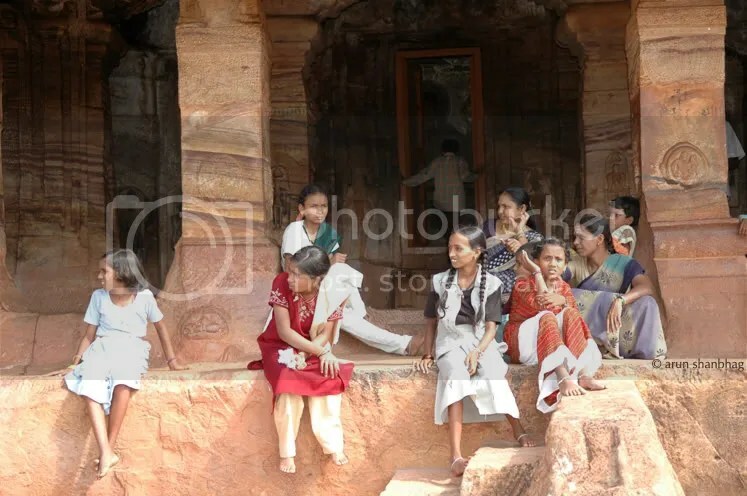 A group of women and girls taking a break from climbing the hill to enjoy all the caves! 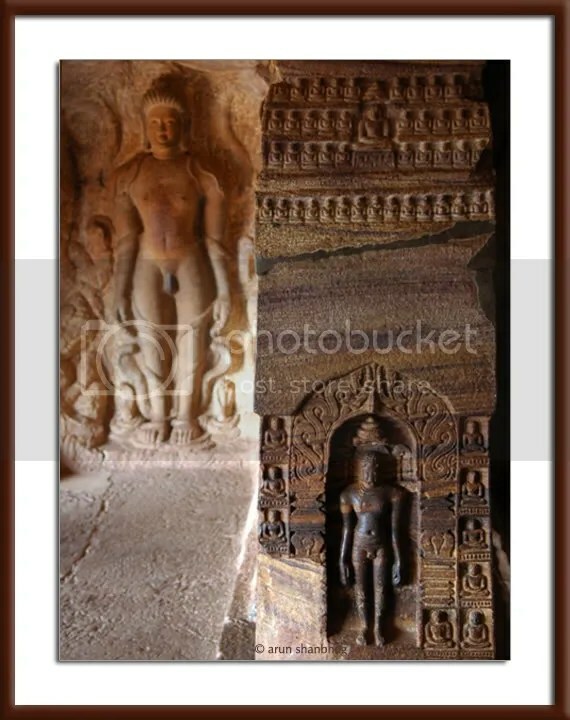 NB: I have denoted the two larger images as Mahavira; I am not certain if they represent any of the other Tirthankaras. If you have any good evidence to indicate otherwise, please bring it to my attention. NYTimes article on the Jain Masters: Compassionate Masters of the Universe. 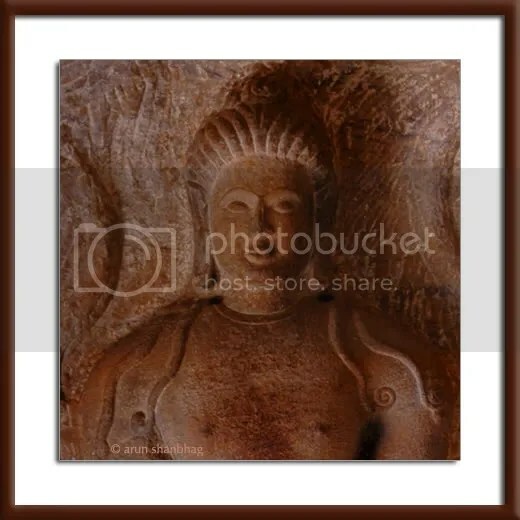 This particular picture however is of Bahubali-ji, the son of the first tirthankar – Rushabhdev, the same of the Shravanbelgola temple. He is quite popular with the Digambara sect of Jains, so there are quite a few idols of him in Karnataka, MP etc. Legend has it that he was fighting for the control of the whole empire with his brother, Bharat (parallel to the Hindu story) but at the last minute he decided to leave that, and follow his father into the spiritual path. His mild arrogance didnt let him bow down to his juniors by birth, but seniors in the religious order.. so he penanced alone – for a long long time. Over time the leaves etc began to grow around him, and the creepers creeped up his body (so the idol always has vegetation on it) – but he still didnt achieve self actualization. He was then made to realise the error of his ways after a cryptic message from his sisters, and the minute he stepped forward to ask for forgiveness, he achieved self actualization. He is not a tirthankar though, but has achieved keval-gyan and this is on par with the other tirthankars. Each of the 24 tirthankars have their own symbol, but there was none under this idol. The symbol of Mahavir is a lion. Sorry for not replying to this earlier. Really fabulous information. Based on what you said I have gone back and done a lot of research on these caves and it appears I will have to rewrite this series of posts. Oh, well – that is the good part of having an online post, its easy to edit. And thank you for taking the time to help me with this. The pictures are very nice, out family enjoyed it. Thanks. yes, Rachna – it is Mahavir of the Jains! You should visit some time! wow breathtaking beautiful…by mahavir, do you mean… the main diety that Jains pray to? great time; will look it up. j’s marathon was great. 4:13. have posted about it here. it was a fabulouse visit which I will remember for a long time. just fabulous. love the post and pics.